Beauty Blog by Angela Woodward: Does Cutting Your Hair Actually Help It Grow? Does Cutting Your Hair Actually Help It Grow? I have always been told cutting your hair regularly helps it to grow, all of my hairstylists have always told me that. But I have also heard that is a myth and isn't true at all. What do you think? First of all thank you Cate for writing me in with your question. For those of you who do not know you can contact me by filling out the form on the right hand side of your browser that says "Ask Me Anything". I don't get nearly enough questions from you guys and I would love to answer more! Now onto the questions at hand, this myth has been widely debated back and forth for years, and here is the answer. Yes it does help your hair grow. But also no. It's complicated, which is why it's hard to get a clear answer. I am going to tell you the science behind this claim and why pros suggest you cut your hair every 6-8 weeks. At the end I will reiterate the reason some say yes, and why others say no. So here is how it works. Your hair grows from a follicle on your scalp (obviously). It grows in three phases, the Anagen Phase (which is where the hair is actually growing) the Catagen Phase (which is where the hair is resting, just chillin, not growing, not doing much), and the Telogen Phase (where the strand falls out of the follicle and the follicle prepares to grow a new strand). While your hair is the Catagen phase, you should try your best to take VERY good care of it. Everyone has a difference catagen phase, just like everyone has different metabolism. So some people might have shorter catagen phases (which may mean their hair never seems to grow very much) or someone may have a longer one (which makes their hair grow super long, like past their bum long). Some people have a fast phase and others are slower. Speeding up and elongating your catagen phase is not impossible. It takes a healthy, balanced diet and regular exercise. So now to split ends. When your hair is splitting it can be a from a few things. Mal-nourishment, poor nutrition, lack of protein in the hair, dry air, damaged cuticle, heat damage, chemical damage and more. So what happens is your ends get all roughed up and begin to split. It splits up the hair shaft and breaks off, then a new split forms and begins to break upward again. This causes those straggly, uneven and yucky looking ends on someone who has not had a haircut in a very long time. 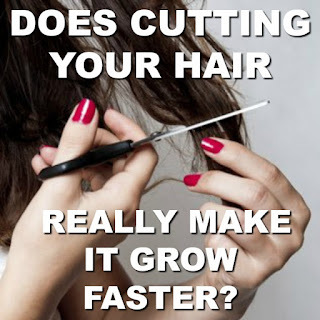 So here is the deal - cutting your hair doesn't make your hair grow faster. It has no bearing on the catagen phase of your hair, and does nothing to stimulate the scalp. BUT it can help because if your hair splits and you get regular baby trims, you keep those ends fresh and healthy and split end free. Then it doesn't break up the hair shaft and give you a "natural hair cut". This allows your hair to be longer because it's not breaking off. So yes, haircuts help your hair to stay longer, but it doesn't help your hair to grow longer.